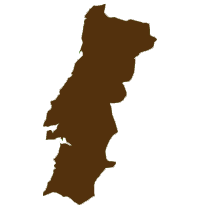 Discover the towns and villages of Portugal in a rural itinerary with several centuries of history! This rural trails is a classic Grand Route (GR), ideal for hikers with stretches of cork tree forests, mountain ranges, valleys, rivers and creeks, in a true journey through time and local traditions. Arriving to Santiago do Cacém, located away from Alentejo’s coast, is well worth exploring, it is an interesting town, passage point of walkers since the medieval age, it is nowadays council’s head-office; great panoramic views over the city and towards the hill with the castle and city’s church on top. Wonderful walk along the coastline always with an amazing sea view. Starting in a very picturesque historical village called Porto Côvo, passing by a small Island called "Ilha do Pessegueiro" with the option to go by the beach taking the hard sand or going a little bit more inland by the dunes path. You will find some stunning beaches, some of them desert, and after that, almost at the end you have a fishing harbour in the north area of Vila Nova de Milfontes. - Leaving the village of Almograve behind you will be once again exploring landscapes along the unspoiled coastal Alentejo. Passing by a fishing harbour (Entrada da Barca – on route). Allowing to walk next to the cliffs with panoramic sceneries. It´s possible to watch cliff-nesting storks. You can use the little village of Cavaleiro to do a stop, have supplies and enjoy a good and homemade local dish just before heading West to the beautiful lighthouse of Cabo Sardão. 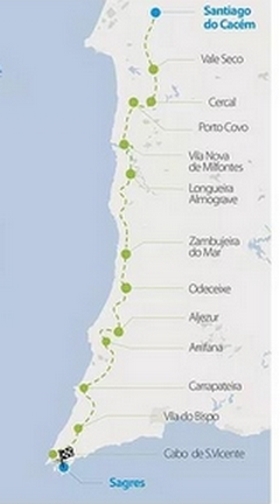 The end will be in Zambujeira do Mar, with one of the most amazing urban beaches in Portugal. Maybe one of the most popular hiking routes used by the fishermen´s that goes South direction to the first Algarve village (Odeceixe). But before getting there, plenty do explore, feel and smell, being the Carvalhal Beach, the residence of the famous "fado" singer Amália Rodrigues and the locally famous harbour "Azenha do Mar", some of the highligts. After recharging your batteries at these Azenha do Mar seafood restaurant after you will have the energy needed to get Odeceixe River and cross the bridge to get to the Algarve. the travel to the start and from the end of the tour.